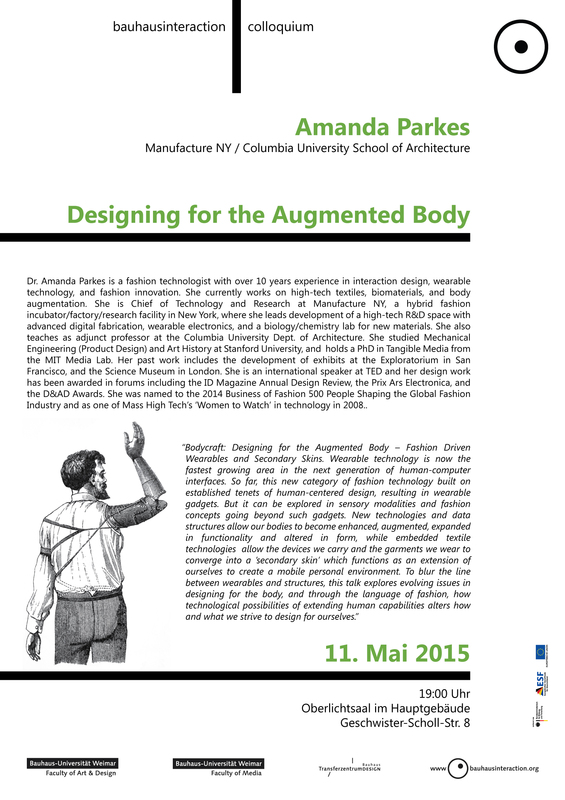 Dr. Amanda Parkes is a fashion technologist with over 10 years experience in interaction design, wearable technology, and fashion innovation. She currently works on high-tech textiles, biomaterials, and body augmentation. She is Chief of Technology and Research at Manufacture NY, a hybrid fashion incubator/factory/research facility in New York, where she leads development of a high-tech R&D space with advanced digital fabrication, wearable electronics, and a biology/chemistry lab for new materials. She also teaches as adjunct professor at the Columbia University Dept. of Architecture. She studied Mechanical Engineering (Product Design) and Art History at Stanford University, and holds a PhD in Tangible Media from the MIT Media Lab. Her past work includes the development of exhibits at the Exploratorium in San Francisco, and the Science Museum in London. She is an international speaker at TED and her design work has been awarded in forums including the ID Magazine Annual Design Review, the Prix Ars Electronica, and the D&AD Awards. She was named to the 2014 Business of Fashion 500 People Shaping the Global Fashion Industry and as one of Mass High Tech’s ‘Women to Watch’ in technology in 2008.